Carol's Theatre Reviews ~ It's Fun To Go Out: La Jolla Playhouse’s “Kill Local”: Comedy Tonight, Tragedy Tomorrow! 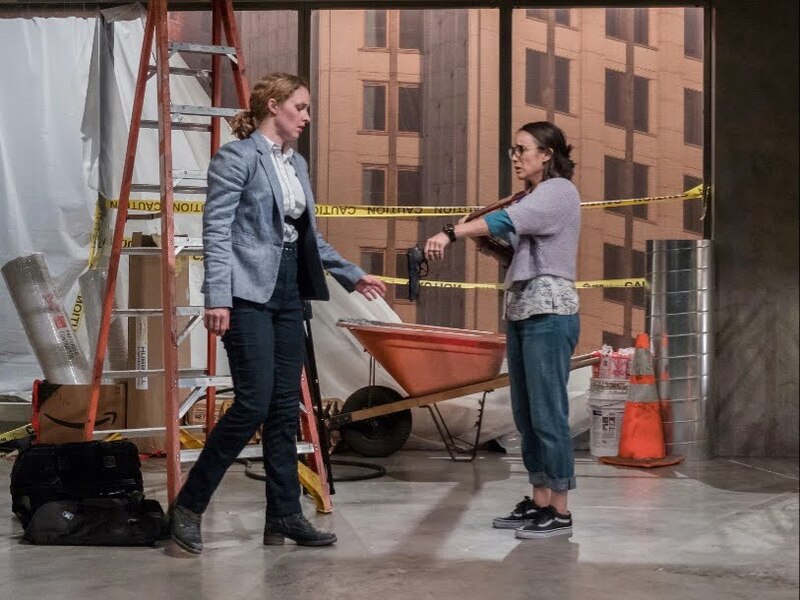 La Jolla Playhouse’s “Kill Local”: Comedy Tonight, Tragedy Tomorrow! 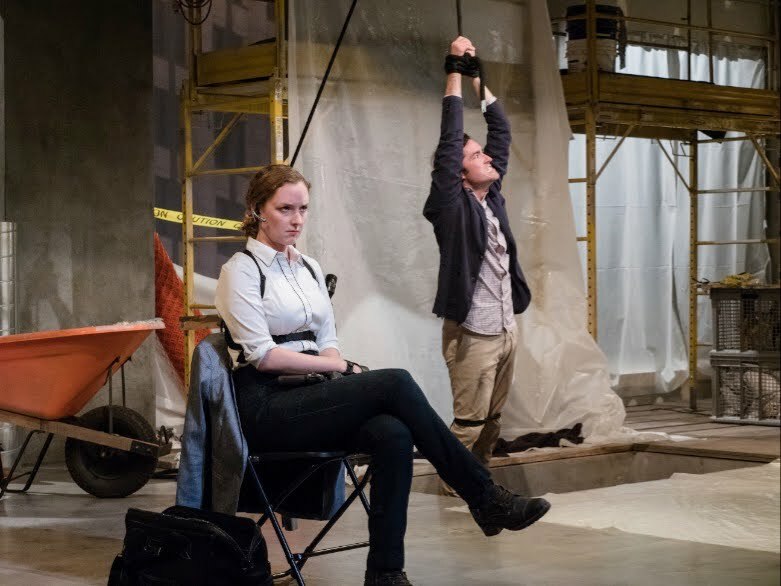 The world premiere of “Kill Local” by Mat Smart opened this past weekend on the Sheila and Hughes Potiker stage. Smart, a graduate of UC San Diego’s MFA program in 2004 was developed at The Playhouse’s DNA new work series that also brought “The Last Tiger in Haiti” that premiered last year. 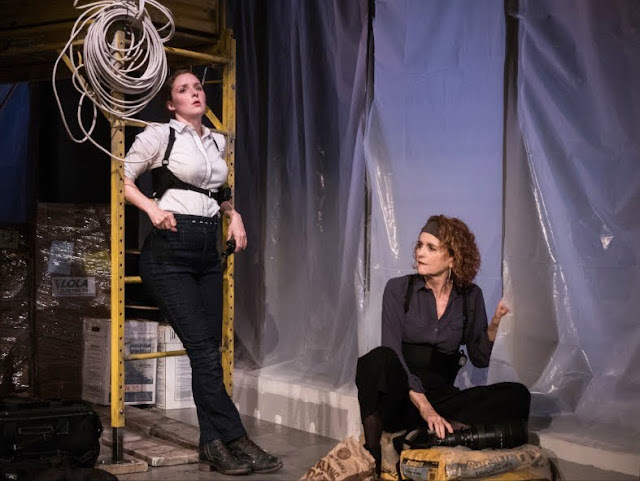 Penned as a dark comedy, Smart’s play tells the story of a family whose occupation is to kill, not in a bad way, (seriously?) but as a tool for revenge in order to right some societal wrongs. Sheila (Amanda Quaid) killed the man responsible for her own father’s killing. She felt justified. Now she is a certified assassin having killed more folks than is revealed. When we meet up with her she is on the fence trying but not knowing how to get out of this creature she has created for herself. Killing doesn’t seem to bring her as much joy to her as it used to. She envies her schoolgirl friend Tara Hutchinson, her two children her minivan middle -America life with her jacket from Zara. Can she create this for herself? Is there a pill for it as suggested by her mother? Follow the dots. Her sister Abi (Xochitl Romero), a graduate of The Wharton School of Business, (‘She doesn’t do concrete’) is a computer nerd; she knows how to break into computers, iPhones, security systems, you name it. She doesn’t kill, but still, she’s in the ‘family’ business of monitoring all the ‘business’. “She never comes to the ‘field’. Does she qualify as a killer by association? Buckley is the catalyst that moves this family. She brings this production to the next level when she comes on the scene as the hard -nosed -take no prisoner’s leader. Think Ma Baker? He is a real estate mogul. Sheila, et al, don’t like his business practices. Sheila lures him into the building on the guise that she is interested in purchasing the building. And then there is Ami (Carolyn Braver). She pops on to the scene claiming to be a student on her way home from class and is just there for her usual after school toke or smoke. Making things easier for the ‘family kill’ Todd has no living relatives for his mega inheritance to be bequeathed, hence it reverts back to the state. They are all on board with that… or so it appears. Ah yes, there are some ironic twists and turns in Smart’s “Kill Local”, but not too many spoilers here. Just know if that the curtain you see upon entering the theatre looks like a plastic shower curtain it most likely is. Plastic being the operative word. The set (Wilson Chin) is an unfinished high-rise with scaffolding, bags of fast drying cement, tarps, work lights, a long carved out trap big enough for at least two bodies to be buried in, a wheel barrel, building supplies, a few chairs, some boxes, yellow tape roping off unfinished windows covered with plastic for (Privacy?) and lots of plastic, (the easier it is to clean up blood spattering’s, my dear). It is here that we meet Sheila and Todd. He’s suspended from a rope, hands and feet bound and not looking very optimistic. And yes, he’s hanging over one of the floor traps, pleading for mercy. Director Jackson Gay (“Kingdom City”) keeps the conversation going as much as he can, but there are lulls in the two-hour (+) comedy/drama that can’t make up its mind if it wants to be a morality play or a black comedy. References to the ‘Second Coming’, redemption, The Lords Prayer, forgiveness, an eye for an eye are brought up throughout. But in the end, well, as we say in my house, "It is what it is." Is the premise of play somewhat preposterous? Yes. But… not if you’re part of the Cosa Nostra Family or Felix Arrelano gang. Will some see the humor/satire? Yes. Will we see blood and guts? Yes. Will we see violence” Yes. Either way it does bring out some likely questions. The first that comes to mind is, 'is the act of wanton killing ever justified? You have to be the judge of that. In any event the playwright does drop some clues about the characters and their thinking. Without a doubt, the cast is top notch and production values (lots of blood and gore) at the Playhouse are always excellent. Jessica Ford designed the costumes. Paul Whitaker’s lighting design is awesome showing the changing times of day and night. Steve Rankin is fight director and Broken Chord designed the sound. It’s about the theme and the fact that we can make so light of killing another human being that struck me as rather callous at the outset. (I never did like the offbeat/macabre movie ‘Fargo’ nor did I think that funny either). I know humor can bring out the best and the worst in us. I also know that it can become a release for bringing attention to or a lightning rod to see the righting of a wrong. This one didn’t tickle my funny bone. Maybe the playwright is on to something, maybe not. Just recently there was a homicide in my neighborhood. I don’t know much about it, but the fact that it happened less than ten minutes after I drove by the house, on my way home from seeing a play, gave me the chills. A young boy was shot to death, multiple times, in front of his house.